The MSc course is in its second week and now everyone is engaged with the on-line (Moodle) system. We’ve had applications for the next term (Sept 2016) already. If anyone is interested – drop me a line and I can put you in touch with admissions. We will have some exciting news about these short courses in the next few weeks. Very impressed at the versatility of creating on-line courses in Moodle. Using playlists for lectures allows students to review sections, the week-by-week format allows me to set tasks and check progress and the reporting analysis keeps a track of access. Coupled with he discussions forums and progress checking, this looks like an ideal platform for distance learning. Level 8 Level 8 qualifications recognise leading experts or practitioners in a particular field or profession. Learning at this level involves the development of new and creative approaches that extend or redefine existing knowledge or professional practice and will often contribute at least locally, although more likely regionally or nationally to the area or sector of the doctor’s thesis. Level 7 Level 7 qualifications recognise highly developed, advanced and complex levels of knowledge which enable the development of in-depth and original responses to complicated and unpredictable problems and situations. Learning at this level involves the demonstration of high level specialist professional knowledge and is appropriate for senior professionals and senior managers. Level 7 qualifications are at a level equivalent to Master’s degrees, postgraduate certificates and postgraduate diplomas. Level 6 Level 6 qualifications recognise a specialist high level knowledge of an area of work or study to enable the use of an individual’s own ideas and research in response to complex problems and situations. Learning at this level involves the achievement of a high level of professional knowledge and is appropriate for people working as knowledge-based professionals or in professional management positions. Often, registered professionals such as nurses, pharmacists, social workers, teachers and doctors enter their profession with a Level 6 qualification. Level 6 qualifications are at a level equivalent to Bachelor’s degrees with honours, graduate certificates and graduate diplomas. Level 5 Level 5 qualifications recognise the ability to increase the depth of knowledge and understanding of an area of work or study to enable the formulation of solutions and responses to complex problems and situations. Learning at this level involves the demonstration of high levels of knowledge, a high level of work expertise in job roles and competence in managing and training others. Qualifications at this level are appropriate for people working as higher grade technicians, professionals or managers. 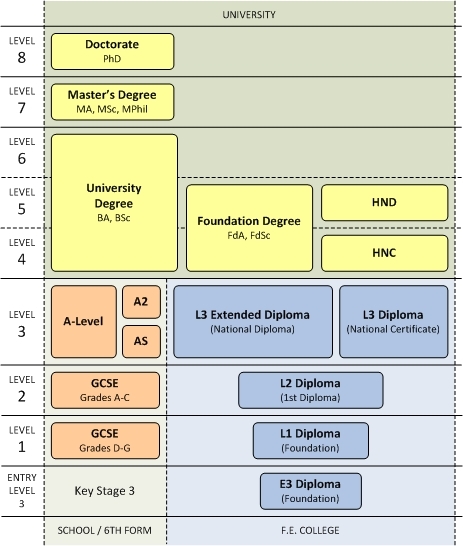 Level 5 qualifications are at a level equivalent to intermediate Higher Education qualifications such as Diplomas of Higher Education, Foundation and other degrees that do not typically provide access to postgraduate programmes.